(1) Teach the truth in love – Ephesians 4:5-16. (2) There is Only One Reason to be a Christian – because it’s objectively true – 1 John 5:19-20. “There is one and only one reason, and not two reasons, to be a Christian, and that is because Christianity is true.” ~ Edith Schaeffer quoting her husband. (3) The Bible is True in All that it Affirms – 2 Timothy 3:16-17. (5) A Church Without Discipline or the Ability to Discipline Ceases to be a Church – Matthew 18:15-17 and 1 Timothy 5:19-20. (6) God is Not Mechanical, but Personal. God is the Infinite/Personal God – John 17:1-3. (7) No One Becomes a Christian Apart From the Work of the Holy Spirit – John 15:26-27; John 16:7-11; 1 John 5:6-12. (8) Pray for the People of the Lord’s Choice to Come, Pray for Him to Keep Others Away. Pray for the Lord to Meet Your Needs Without Asking for Money – Matthew 9:36-38. (9) If Your Choice is Between Perfection and Nothing, You Will Always Have Nothing. Do Not Expect a Perfect Church, Pastor, Elder, People, Thing, or Situation in This Fallen World in Which We Live – Matthew 5:48. I thoroughly enjoyed the author’s account of the Schaeffer’s, and his distillation of their teaching and how they modeled their teaching through their ministry in Switzerland, and in the United States. I highly recommend this book for anyone who wants to better understand the gospel, how to use apologetics in pre-evangelism, and how prayer and life-style evangelism are essentials in reaching people in the 21st Century. The Schaeffer’s are just as relevant today as when they lived in the mid to late 20th century. One of the most common misconceptions in Biblical interpretation today is that “the thousand years” (hence: the “millennium”), of which John speaks in Revelation 20:1-7, are mentioned nowhere else in the Scripture. And since it is generally agreed that no major doctrine should be based on any one single passage of the Bible, it is no wonder then that all too many have concluded that pre-millennialism likewise should not be among any of our major doctrinal creeds. However, a more careful study of God’s Word dissipates this conclusion. The truth is that the “thousand years,” along with parallel expressions, are found in both testaments and constitutes one of the high points in Biblical prophecy. Before we look at some of these key texts, it is important to note that the Kingdom of God in heaven and on earth is one of the grand themes of the whole Bible. A quick review of that Kingdom (in its inception, progress, conduct, and consummation) should set the stage for our considering the key teaching passages in a pre-millennial doctrine. The Two Advents: The Kingdom of God has two advents, two ages, two resurrections, and two end points. Few, except some of Jesus’ own kin-folks, deny that the first advent has already occurred. In a Television debate I had with Rabbi Pincas Lapide on the John Ankerberg Television show a good number of years ago, he observed that the difference between his Jewish viewpoint and my evangelical one was that I, as an evangelical, believed in two comings of the Messiah and he, as a believer in the Tenak (= the Old Testament), only adopted one: a coming of the Messiah in a time of world peace. I replied, “But Dr. Lapide, Zechariah 12:10 says `They will look on me, the one they have pierced, and they will mourn for him as one mourns for an only child… a firstborn son.’ I asked, `Who is the one speaking in this text that they will look on?’ He replied: `The Almighty!’ Then I asked, `How did he get pierced, then?’ ‘I do not know he said.’ My retort was, `I have an idea how: it was at Calvary in his first coming.’ Later the Messiah will come in a second advent in a time of final peace as this same chapter in Zechariah points out.” Yes, there are two advents advocated in the Biblical text of both the Old and the New Testaments. The Two Ages: But besides the two advents of Messiah, there are also two ages: in Hebrew- “`Olam Hazzeh,” “This age,” and “`Olam Habba, “The age to come.” The New Testament Greek employs these same two divisions of time some thirty times: “Aion ho houtos,” “This age,” and “Aion ho mellon,” “The age to come.” The “Age to come” overlaps “this Age” with the work of Christ in casting out demons, and especially in his resurrection from the dead. While the “age to come” is still only in its incipient form, for the second advent will come in the future in its full realization. Even more significantly, there are two resurrections, not just one. Revelation 20:5 speaks of “the first resurrection,” which all too many seek to reduce in meaning by spiritualizing, allegorizing, or idealizing it in place of a literal resurrection. But what John calls “the first resurrection,” the apostle Paul refers to “those who are Christ’s at his coming” in 1 Corinthians 15:23. In fact, the Apostle Paul has given us just as strong a text for pre-millennialism as has the Apostle John in the Apocalypse. The First Resurrection is just as literal a resurrection in John’s Apocalypse as it is in Paul’s “those who belong to him when he comes” (1 Cor. 15:23). And in both John and Paul, those resurrections are separated by a period of time. Nor does the fact that John saw only “souls” detract from a literal bodily resurrection, for the souls that had heretofore enjoyed heavenly joy were now to be reunited with their bodies. Note that John does not say the “souls” “lived and reigned,” but the same “they” who were beheaded, and the “they” who had not received the mark of the beast, were the same ones who “came alive” and were reunited with their bodies and who reigned with Christ for a thousand years. The Two Ends: There are also two ends along with the two advents, two ages, and two resurrections. The first end is signaled by the coming of the Son of Man, our Lord Jesus from the clouds of heaven in his second advent. The prophet Daniel brilliantly laid this out in Daniel 7:9 – 14 as did the prophet Ezekiel in his Apocalypse in chapters 37 – 48. Instead of a Valley of Dry Bones, the nation Israel is resurrected again with an implantation of the revitalizing breath of Life in each of the skeletons of bones as the nation is once again placed back in her own land. This marks the opening of the Age to Come, now in its full view (even though it had been inaugurated in the life and times of Jesus the Messiah), and the thousand year rule and reign of Christ with his saints of both Jewish and Gentile believers. The second end comes with the Great White Judgment throne in which all the rest of the dead are resurrected to be examined by our Lord to see if their names are in the Lamb’s book of Life. This does not end the Age to come, for it goes on without cessation into the eternal state and the Messianic Age of Eternity. Isaiah speaks of the Day of the Lord when Messiah himself will judge and then restore the kingdom to Israel. At that time, the Lord will “punish” (or “visit”) the powers in heaven above and the kings of the earth in such a fashion that they will be gathered together as “prisoners” in a “pit” or “dungeon” and “shut up in prison.” “After many days,” (i.e., equal to John’s “millennium,” but here not specified exactly) they will appear for judgment. At that same time, “the moon will be confounded and the sun ashamed when the Lord Almighty will reign on Mount Zion and in Jerusalem and before his elders, gloriously” (Isa. 24: 22-23). Here, then, is a third major teaching text on the millennium. This is the time during the thousand years when Satan is cast down to the pit “In that day.” It is when Michael stands forth to fight for Israel (Dan 12:1; Rev 12:7) and when according to the vision of John “the angel, having the key of the abyss, and a great chain in his hand, laid hold of the dragon, the Old Serpent, which is the Devil and Satan, and bound him for a thousand years, and cast him into the abyss, and shut and sealed him over, that he should deceive the nations no more, until the thousand years should be finished, or almost so, after which he must be loosed for a little season” (Rev 20:1-3). In this Ezekielian Apocalpyse of chapters 37 – 48, the “whole house of Israel” is reanimated and revivified in the Valley of Dry Bones (Ezekiel 37:5,11). There, as one flock under one Shepherd and one nation under one king, the resurrected faithful dead of the nation Israel are resurrected and taken back to their promised land, just as God had promised in Deuteronomy 32:39; Psalm 17:15; 49:14, 15; Hosea 13:14; Isaiah 25:6–9; 26:14,19; Ezekiel 37:12; and Daniel 12:1-3. Their “many days” of peace and blessedness are expanded on in Ezekiel 37:1– 28, as well as in Isaiah 2:2-5; 11:6 – 9; 24:23; 25:6–9; 60:1–22; 61:4–11; 62:2–12; 65:17–25; 66:20 23. This will be the time when Yahweh Shammah, “The LORD is there” (Ezekiel 48:35) living among them. But again, “after many days,” (Ezekiel 38:8), Judgment will come on Gog with a punishment and visitation similar to what Isaiah 24:22 and Revelation 20:7–10 depict. The termini of Isaiah 24:22, Ezekiel 38:8 and Revelation 20:7 are identical. Remarkably, Ezekiel 28:25–26 notes that Israel will be secured from attack and the people will live in safety and their security will be undisturbed (also Ezekiel 38:8,11,12; Jeremiah 32:36-44). If time and space would allow, we could add Psalm 102:13–22, where Messiah comes with his holy angels with glory to build up Zion. Then he will judge the world in righteousness and “give dominion in the morning.” In addition to Psalm 102, is the expression “In His days,” found in Psalm 72:7. This too is a text noted as a great Messianic Psalm. There is also that group of four bright Messianic Psalms in Psalms 96, 97, 98, and 99, ending in the remarkable Psalm 100. Here every land in the world is called upon to make a joyful noise unto the Lord as he concludes the work in history he said he would do. But notwithstanding all this data (and much more) on the terms for the “Thousand Years,” “Multitude of Days,” “Many Days,” “In His Day,” the case for Pre-millennialism is almost completely missed if one does not focus on the everlasting promise of God made to his people Israel. 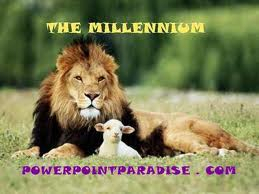 Pre-millennialism is defined not merely as the future time in the Rule and Reign of God (the kingdom of God), bounded by the resurrection of all believers on the front end and the resurrection of the unbelieving wicked dead on the opposite end, during which period Satan is bound, but loosed for a brief time at the end of the millennium before he is cast forever into the abyss. It is more precisely the time when God finishes in space and time what he promised historically to Abraham, Isaac, Jacob and David and his line. It is therefore a whole philosophy of history with implications for the Christ-and-culture-hiatus that must find its resolution in the Lord of all creation and all value and beauty. Principally the Abrahamic promise (Genesis 12:2 – 3) had three parts: (1) the promise of a Seed, the coming Messiah, (2) the promise of the land as a gift to Israel, but owned by God, and (3) the promise of the “Gospel” in which all the families of the earth would be blessed (Paul equated this aspect of the promise with the “Gospel” in Galatians 3:8). It is impossible to read, teach, and preach on the prophets of the Old Testament without bumping into the promise of a return of Israel to her land again and again, something like one verse out of every eight verses in the prophets!!! This is what makes the return of Israel to her land once again in the future the most important and key part of the premillennial doctrine. Some will attempt to say that Israel forfeited that promise when she disobeyed, but what she forfeited was only the right each of those disobedient persons or generations had to participate in the blessing promised. Nevertheless, Israel still had to transmit the promise even though some would not enjoy its benefits. Transmission of the promise is one thing; participation in the blessings of the promise is another thing altogether! To say that the Church replaces Israel is not only a form of supersessionism, but it is also without exegetical merit as I have argued elsewhere (Dr. Walter C. Kaiser, Jr., “An Assessment of Replacement Theology: The Relationship Between Israel of the Abrahamic-Davidic Covenant and the Christian Church,” Mishkan, 21 : 9-20). Yes, Gentiles are included in the term “People of God” (just as the Jewish people who believe are part of the “People of God”), but the term “Israel” never loses its unique national, geo-political, or ethnic flavor. This is not because God has favorites or that he is chauvinistic, but rather because God is faithful and true to his word. Once again, note clearly that there is a divine philosophy of history, in which God does complete within space and time what he proposed earlier on in redemptive history. What is lost, some will ask, if we demote Pre-millennialism to a secondary doctrinal status? Isn’t it true that the majority of Christians today do not recognize it as taught in the Bible – especially in a reformed or covenantal understanding of the text? And if they do not recognize this doctrine, isn’t it also true that most think this teaching is reduced to only one teaching passage in the Bible? But we have shown that it is widely represented in the Biblical text. Moreover, most will also concede that pre-millennialism was the majority view of the Christian Church in the first three or four Christian centuries. It was the influence of Origen’s allegorizing tendencies, St. Augustine’s change of his mind on this doctrine, and of the collaboration of Eusebius, Bishop of Nicomedia, with Emperor Constantine in their desire to capture the geo-political sides of the discussions of the Kingdom of God that brought the major change into the life of the Church. But what is affected the most is the doctrine of redemption and God’s promise-plan for the ages. It becomes a much more difficult matter to teach the Kingdom of God with its two ages, two advents, two resurrections and two ends without these key texts. Moreover, most will need to shy away from teaching the whole counsel of God, especially as it is found in the prophets. Also, the very warp and woof of salvation, which Paul says in Romans 1:16 instructs us that it is impossible to talk about so great a “salvation” without at the same time noting that this Gospel is the power of God for salvation of everyone who believes: first for the Jew, then for the Gentile. Romans 9–11 then, becomes not a parenthesis or an intercalation that interrupts the main flow of the story of redemption; on the contrary, one cannot talk about the gospel or our salvation without constantly intermingling the Jew/Gentile question. Like it or not, the Jewish question will be the ragged edge on which many will be tested and found deficient from an truly exegetical standpoint of the clear witness of Scripture. (5) problems with being ashamed of the whole redemptive program of God that is for the Jew first and then for the Gentile/Greek. Posted by lifecoach4God on April 12, 2012 in Biblical Theology, Eschatology (The Study of Last Things), Israel and Prophecy, Theology Proper (The Study of God), Walter C. Kaiser Jr.